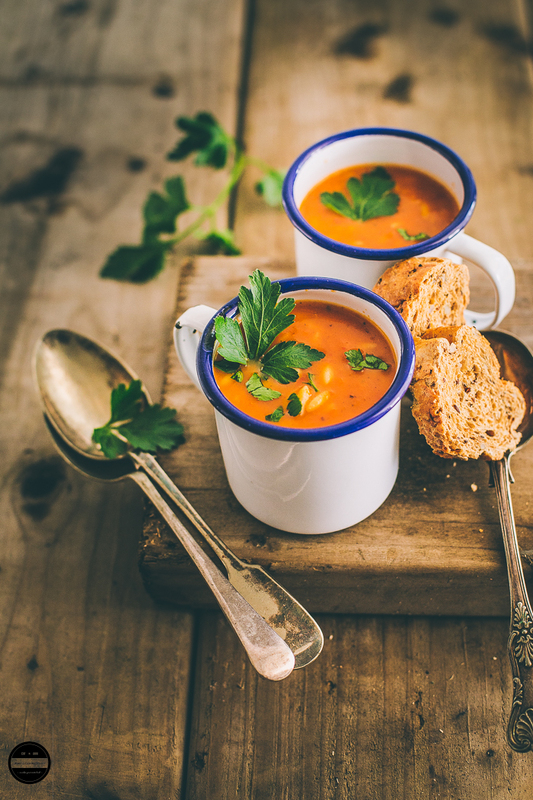 A blissful bowl of Tomato, Harissa and Orzo Soup, is bursting with amazing flavours! There is just so much comforting goodness in every spoon of this soup. It's vegan, hearty and spicy that keeps you full and warm. It's a perfect choice when you want to have a full meal yet light on the tummy. Yet I am posting one more recipe for soup! While in the other parts of the world some of you guys are making pickles in scorching heat and holding chilled drinks in your hands to beat the heat. we are far away from that kind of weather yet as a week ago we were badly battered by a snowstorm which left all of us in a very vulnerable condition. In many places being sub-zero temperatures, and heavy downpour there were power cuts and the whole country faced transport chaos. Many had to face empty shelves in the supermarkets as delivery drivers could not deliver to the stores and the stores had to cancel thousands of home delivery services due to icy conditions and transport chaos. It is all well to enjoy visually all these piles of snow like in Yash Raj films and getting by mesmerized by the white snow, Only looks so pretty in Bollywood movies, but becomes a huge problem in real life as it does cause so much havoc and chaos for all. But spring is around the corner! Although the situation is under control now, snow is gone and temperatures are going slightly up. But while I'm drafting this post, just came to know that we may need to bring out our woolies again because freezing weather is coming again with more snow on the way this weekend! 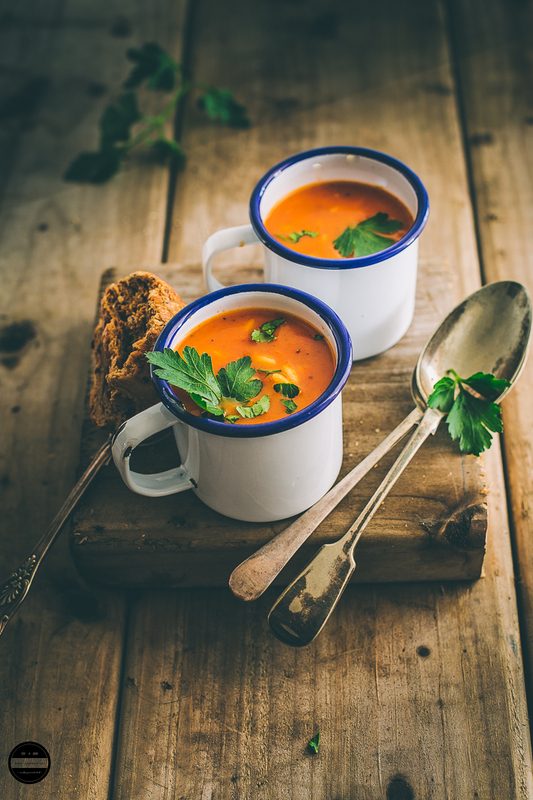 As soon as temperatures drop my mind turns to the simple pleasure of stirring a big batch of soup. I was more than happy to prepare family's favourite Tomato, Harissa and Orzo Soup, that you want to make again and again. This frugal soup is loaded with the goodness of tomatoes, harissa paste and energy providing Orzo ( rice-shaped pasta) with full of taste and texture. 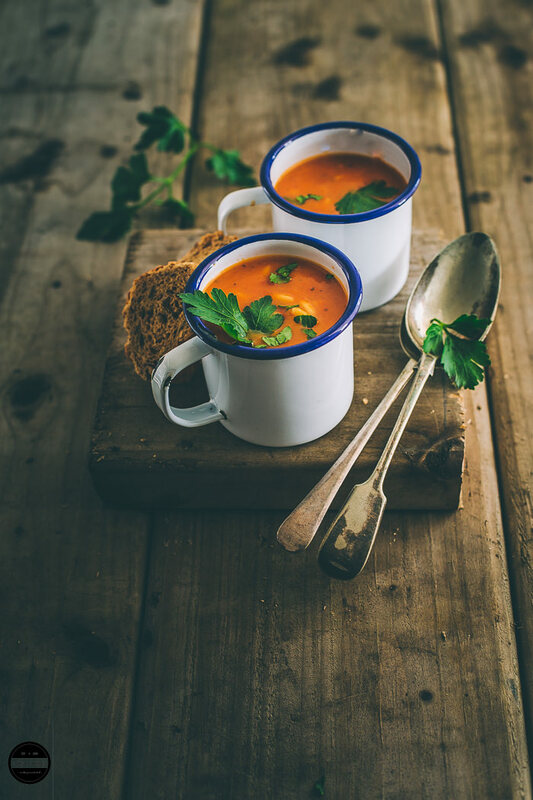 You can serve this soup any weeknight along with wholemeal or multigrain crusty bread and fresh salad for a hearty and filling meal or on its own for a light lunch on the next day. Adjust spice levels of this soup according to your taste. If you don't have Orzo pasta, add small macaroni pasta. 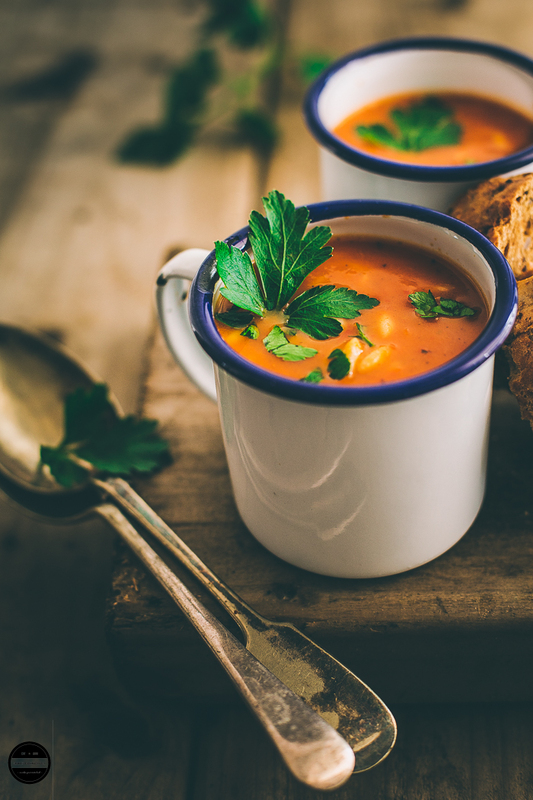 Enjoy this blissful bowl of tomato, harissa and orzo soup with crusty bread that is comforting and easy to prepare. Heat oil in a saucepan and add onion, celery and garlic.Cook until translucent.Add harissa paste and fry for a few seconds.Then add fresh tomato, canned tomato and tomato paste.Mix all well then add vegetable stock and salt.Bring the soup to boil and simmer until tomatoes are done.Turn off the heat, then puree the soup with a hand blender, you can keep some tomato chunks intact.Then add orzo pasta, Italian herbs, and little water if the soup is too thick.Cook the pasta until well cooked.Add black pepper powder and red chilli flakes if using.Serve in a serving bowl, garnish it with the fresh parsley and enjoy hot with crusty bread. Enjoy! 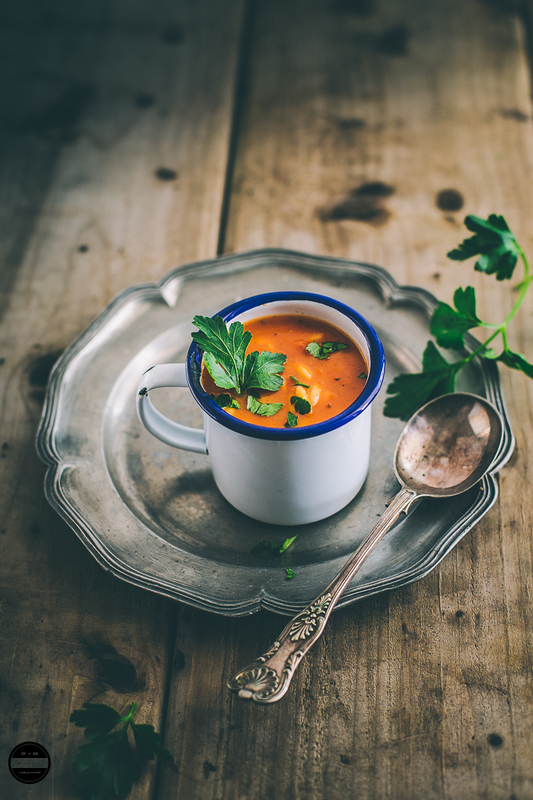 Yummy and Filling soup ... Makes a meal for me.. Love the rustic vintage props used there!! Snow sounds so magical and beautiful in the movies but it can create such a havoc in real life. I hope you this time it’s not going to be too bad. Good luck. That soup looks so comforting. I am sooo tempted to make it right away, I know my son will love it. Perfect for the weather. Love cozy and comfort soup with side of garlic bread. Am sure a bowl of this soup will definitely please my tastebuds without any fail. Just a prefect hearty soup for the dull climate here. Thank you for introducing us to your world. My kids always has this dream of playing in snow. As usual, clicks are classic. I can have The whole batch of soup. It's ok in summer too. Tere haath ka na. I can feel the warmth and love in it. Snow can play havoc just like rain can. In fact nature can be a fiery mistress. Hope you do not have the condition you have described again. Meanwhile I think we will love this soup when it starts raining. Sounds good and tempting, this is perfect for the winter day treat. adding Harissa paste is awesome.. This looks absolutely delicious.. I love all varieties of soup and this sounds flavourful. Loved the vibrant colour of soup ! Harrisa must have given a nice twist to the tomato soup and with orzo it would make a nice and filling meal. The soup looks so inviting, though need to try these flavours. Hope things are better for you now. That looks like a comforting bowl of soup for that cold weather in London. Gorgeous pics as usual. I agree about the fact that snow looks beautiful only in the movies, whereas in real life, it can certainly disrupt normal life, especially when it decides to snow for 3-4 days at a stretch, making normal life a mess! I am not at all a snow person, I cannot otherwise bear winter / cold and I am okay with summers or monsoons any day. A holiday would be okay but then again, not for long. The only way to beat such bitter cold is having a mug of soup, which is brilliantly shot by the way. Loved the harissa inclusion and the pasta. Hearty meal for the cold. I otherwise prefer soups throughout the year, makes me full and content, esp for dinner option. Loved the recipe dear. This tomato harissa orzo soup is really perfect soup for anytime. Orzo is a new ingredient to me. Now a days I am making soups very often. I find them easy these days to prepare. Lovely clciks. I absolutely love this soup! It is snowing here as I write and I wish I could just pick up that cup. I like the combination of flavors, harissa is a favorite and the orzo in it! Loved the flavors, A war bowl of soup is so comforting on a snowy day. We had a lot of snow too, and I need this soup right in front of me, Amazing clicks as always.